Any long running franchise has to contend with the fact that as time goes on, parts of the audience will drift away. Kids shows in particular have the added factor of peer pressure; you’re expected to outgrow certain shows and not doing so tends to be looked down upon. I know I got some flack for liking a few things longer than I was “meant to”. With this churn in mind it’s possible to look at Precure from the angle that you’re not really meant to have seen it all. Or at very least the target audience aren’t expected to. This churn probably contributed to the episodes focusing primarily on the last few years casts, which worked out well for me given that’s coincidentally the three I’ve actually seen. Just look at these extremely good mascots hanging out with Pekorin. I’m a real sucker for crossovers where characters just hang out, so the first episode was a delight. It was almost a shame when the plot kicked in and they had to start hunting for the other Cures. It was nice to just spend some time with all these characters again though. At the same time this emphasis on the recenct series felt like it might overshadow the older characters, even if I’m not familiar with them it’d feel kind of like a let down if they were just sort of there. What we actually got was insane. Somehow they managed to fit fifteen years worth of Cures into a single fight scene while still giving everyone a chance to show off, even if only for a few seconds. Rather than feeling alienated by all these characters I don’t know this crossover only made me more enthusiastic. However long it takes I’m looking forward to meeting all of these characters some day. 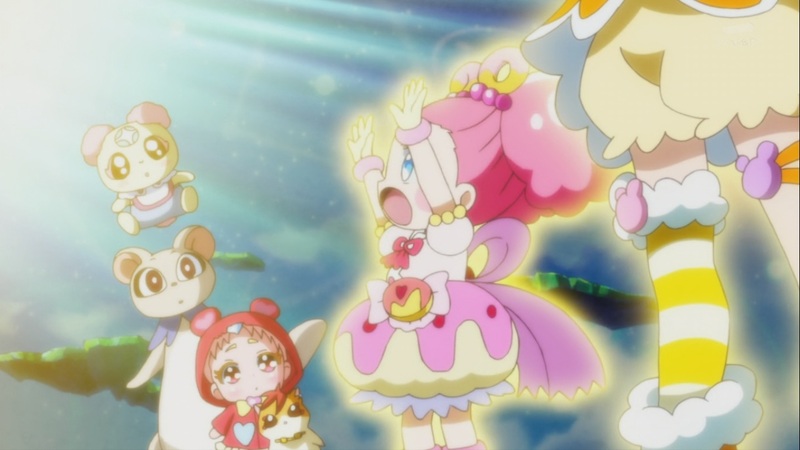 It’s super hecked up though that Cure Mofurun finally got to appear outside a movie but they only showed her legs.